Redface Welding Machine...actually the one in the Video below is a black face. 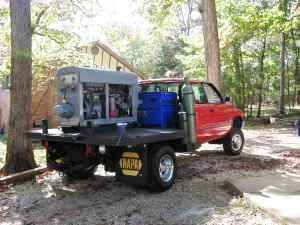 What is a redface welding machine? The term redface welder is used to refer to a Lincoln sa 200 all copper wound welder.The thing that makes them in such demand is not just the copper windings. They have actually become somewhat of a collectors item with all the nostalgia of an old Harley. They are called a redface welding machine because well...they have a red faceplate. Its the copper windings that makes them in demand. Pipeliners typically burn rod after rod after rod and when you are laying in root passes for a living, sure you need finesse and a soft touch, but you also want a welder that welds the same on the first rod as it does on the 27th rod. At some point Lincoln starting using aluminum, or even copper flashed aluminum wire. It is said that most of the red face welding machines have 100% copper winds in the generator. and most of the black faces dont. But...you cant tell for sure whether a lincoln sa200 has copper windings because many of them that were manufactured with aluminum wire have been rebuilt with copper windings. There are even electric shops that specialize in stuff like restoring old redface welders. The only problem about the ones with aluminum in them is that they start off the day like any redface sa 200 but then as they warm up you have to keep turning up your remote more to get the same heat. Then you stop for a coffee bread and they cool off again.. and you have to go through the amperage changing thing all over again. 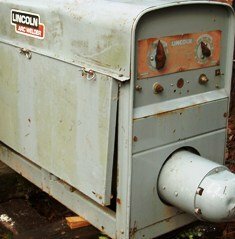 Lets talk about other Old welding machines for a minute. Old things were built sturdier. Even the old Miller Syncrowave 300 tig machines have a ton of copper in them. They are bigger than a refrigerator and no one really wants them anymore but they are a really awesome stable tig welding machine. Its hard to believe that a Miller dynasty 350 inverter puts out as much amperage as the huge syncrowave 300. But which one is more dependable and more stable? The jury is still out on the dependability of inverters. Here is a tip for you...when you are looking for a lincoln redface or any other welding machine for sale. Just type "craigslist redface welding machine" or the word craigslist and whatever you are looking for in the google search bar. You will get listings from different locations in the country but you are probably going to have to drive a distance to bring a good one back home.